BlueCharlye: Post 49 - Let's speak ET! Post 49 - Let's speak ET! I want to learn light language ideally, (if you can teach me please contact me! any ET language) but as I have been searching the net, I found other words that I'd like to list here. Here is a collection of my findings. Please note this is regurgitation / copying, so there may be false language or mistakes, please excuse! If you are a starseed, I hope this recollects memories, or if you are wanting to impress a friend, I hope this is sufficient! Most Sirians (according to the source) live inside of the planet, 'inner-Samanet' There are (grown) crystal cities within. At the temple bridge when the sun rises (Sirius) it makes special violet light patterns on the East side on the stairs, as it rises. "the soul of feminine creativity"
Sirian wording for their white-toned and smooth to the touch, special jumpsuits, is "metraknen venabu." This literally translates as utility wear. Note that "veletos" are deployed in threes, as the scoutships, likewise, deploy in defensive triad formations. Under the veleto, standard jumpsuits are worn and in accord with GFL colour-coding, personnel of the Sirian star nation (akanowai dajoie) wear white. Kalo, ni may bana icem! Now you'll really be ready for disclosure! One year on Erra lasts exactly as long as it does on Earth but it's divided into 13 months (an "Asar" in their language) instead of 12, with a compensating time of 23 years. A day (or "Musal") has 23 hours and 59.4 minutes. An hour ("Odur") correlates almost exactly to an earth hour. Sharem efga means: "I am not ready to meet you – I don't want to meet you now." Sharem means: "Go away," or "Disappear," or "I don't want to...."
Ili akhar de mash de mashana (Ile äkäɾ ɗɛ mäʃ ɗɛ mäʃänä) - the recognition of the creation in each other, or the mutual creative potential/ability. Shi va - shi vi (ʃe vä ʃe vaI) - "I am completely in my passion, stand aside for I'm coming through"
Ha'atu (häʔätʉ) - "I love you"
I visited several blogs however the audio feature for audio songs existing at this site is actually excellent. Yes, but no worries, I hope that you learnt a few things! 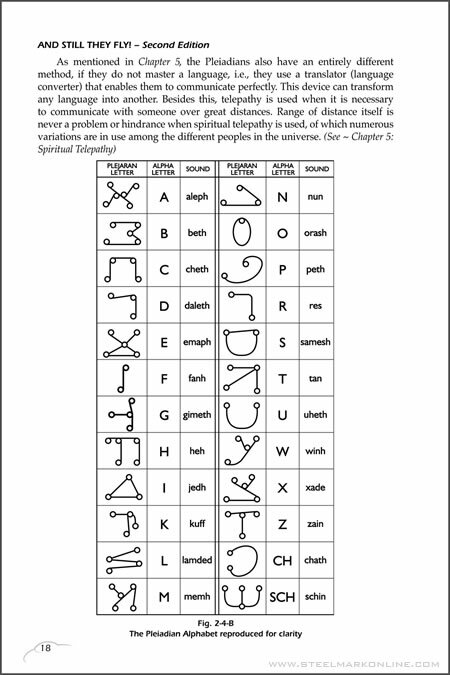 And these are just bits, please do refer to ETs such as during telepathic communications or called upon channellings so that you may get personal and correct information! Yes, and these are just little bits of information, from a few places, so please refer to other ET telepathic communications or personal channellings for your own experiences of the language/s, so that you get correct information! Hello to all, the contents present at this web site are in fact remarkable for people experience, well, keep up the good work fellows.